What did you say about my Gearscore? A little late... And then there were eight. For Earthday I'm revisiting and recycling an old blog post, it's one I still feel is somewhat relevant and needs to be said over and over and over again: Bring the player not the gear. Running heroics in a mishmash of Judgement (Paladin T2) and normal gear with an average ilevel of 200 (naxx10 level gear) for the lulz. DPSing TotC10 and 25 on my Mage for which WOW its self said my gear wasn't good enough for. Healing ICC in my Druid who wowheroes said it wasn't ready for. One of my guildlings put together an ICC25 just for the sake of killing stuff last week. We, unfortunately, had a gearscore whore who spammed his recount gearscore meter to point out he was in the top 10. This player spoke up on vent in awe at the number of female voices speaking on vent, saying his previous server didn't have many girls and he was shocked. I monotoned at him, "I'm really a guy, I just have a hormone disorder." The guy made a lot of noise in vent about how awesome he was and was trying to tell me (who had a greater gearscore than him) how to properly utilize him. He carried on, this resto shaman, explaining the mechanics of a shaman healing. My dear readers, you can see the bar on the lefthand side of this blog. You see that dark blue 80? That's my resto shaman. I informed him that I had a resto shaman and that he should shut up, that he was jumping up and down on my very last nerve. Of the seven healers, I scored dead last on the meter, with a 77% activity time. My reason? I disconnected for a good minute of combat. The tanks didn't die so we paladins did our jobs. The shaman? He was 5th below people who had inferior gear scores to him. Why did these players beat him? Skill > Gear. Right before TotC came out, a guild on my server got crit by the summer boss and called it quits. In the beginning they were a guild competing on a worldwide scale, top 100 US guild, priding its self in having some of the strongest DPS around. Recently they came back to the game, back to our server and our faction. Their guild leader, another holy paladin who's amazingly good, is a friend of mine and last night he came to me and said, "Dude. Fix your gems. Stop being bad. Use this and this instead of what you're doing now." I did so, knowing that he's not someone who's saying anything to be mean spirited. From there, we got to chattering and ran a daily heroic with our tank retting, me tanking, and the him healing. He's still in 226ish gear with a few crafted and purchased items, he's been away from the game for about 5 months. He asks us, "What is this 'gearscore' thing everyone keeps talking about?" We explained that it's an addon people use that somehow calculates the quality of people's gear and gives them a numerical score. It has no actual correlation to gameplay skills, especially when people can farm triumph badges so easily. He'd taken a group of people into TotGC25 for the first time and got Anub to 1%. Some of his raiders in 226 Uld gear outdps people in full 245s. Why is this? Skill. Why can I heal timed HCoS runs in a mix of modern and Judgement while my tank pushes 4k dps while in a mix of his ret gear and Judgement? Gear's a fallacy. I've said it over and over and over again: Putting gear on a bad player is like putting lipstick on a pig. No amount of gear will help a player who refuses to learn what buttons to push or move out of the fire. 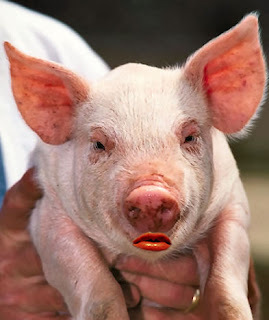 Likewise, a pig will always be a pig even if it's wearing lipstick.